2010 was a year in which not much planning was done so scouting for new locations was high on the agenda because all the popular photography destinations were fully booked. In 1986 we were privileged to have lived in Windhoek, Namibia for two years and ever since then whenever I am asked the question “where would you like to live if you could choose” I would have to say that I would pack my bags in a second if the right opportunity came along and hightail it to Namibia. So, while watching good old National Geographic Channel one lazy Sunday afternoon an episode of Into the Pride was screened. When I realised I was looking at Namibia my interest was naturally piqued. Dave Salmoni the “lion tamer” was irritating to say the least and I found the pride of lions much more fascinating. Then, when I researched the reserve and found that it is a mighty 70 000 hectares with only one Lodge on it – I was more than interested. An email asking for rates revealed that because I wanted to stay for longer than 4 days the rates were most favourable. So, on 17 July we found ourselves winging our way to Windhoek. Then a 3 hour transfer to the reserve and we were most impressed. For those of you looking for comfortable digs....this comes out being really impressive. The rooms are built around a manmade waterhole which is a bit iffy to say the least, but on the other hand it certainly gives you so much to look while you are in the room that you don’t really want to go to sleep! The cons part of the Lodge is that it is very commercialised and with about 100 beds you don’t get much personal attention but, I was here to see the animals. On arrival in Namibia I recommend that as you alight from the plane you lift your head to the skies. The term azure blue takes on a whole new meaning when you see the unpolluted skies of Namibia. It was like returning to a good old friend and I could feel a sense of homecoming creeping into my bones. Our first drive produced the golden light, but it was wintertime and as soon as the sun started setting the wind developed quite a bite! However, as we were “old hands” we had come prepared and out came the buff, ski gloves and ski jacket. A backlit waterbuck at a waterhole set the tone for the rest of the stay. The waterholes at this reserve are clear of any trees and are thoughtfully excavated so there should be good opportunities for unhindered shooting. The other highlight of the afternoon was a visit to a sociable weaver’s nest. (I so prefer the Afrikaans term vergadervoel – it is so much more descriptive). And to make it special there was a little pygmy falcon perching on a dead branch right next to the nest just waiting for my camera. Symbiotic relationships are such an integral part of the bush and each time we visit a new reserve we find another relationship we weren’t aware of before. We then sped off to another waterhole to see if we could make use of the last light. During this visit to Namibia it seemed as if we were literally Chasing the Light (cf David Noton’s phrase) as every drive we had vast distances to cover on this huge reserve. We were, however, well rewarded for our efforts. We came across a white rhino perfectly positioned for the imminent sunset. While we backed off to give him space and time to relax we could focus on the activity around the waterhole where there was a journey of giraffes quenching their thirst. I managed to get “that shot” time and again of the awkward pose of the giraffe head framed between the legs!! And even the light played along here. Very satisfying indeed. Then it was back to the rhino and in the dying light the shutter did not stop. The following morning we first took a turn at the boma where they have a captive breeding programme to increase their numbers of wild dogs. As a wild dog (BIG BIG) fan I was interested in the programme and learned that their whole pack was decimated one afternoon during a thunderstorm. Lightning wiped out 14 dogs all at once! They now have two alpha male and female pairs breeding and as soon as the numbers are large enough they will release both packs – one on the northern side of the reserve and the others on the southern side of the reserve. This, in my opinion will hugely increase the appeal of the reserve and add to its diversity immeasurably. We then got a call (the inevitable radio) that there was a lion sighting nearby so off we sped to see! And there was Brutus (of Into the Pride) working really hard for his dinner. 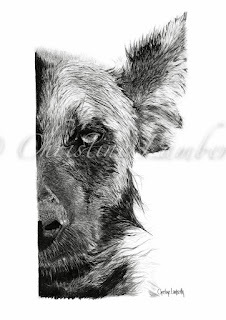 He had chased a warthog down a hole and was proceeding to dig him out. What a sight. Dust and dirt flying all over. And then, after an interminable time he managed to reach the warthog and got his breakfast all sorted out! We were able to watch the whole thing. And this is what is, at the moment, for me as a photographer, the magic of a place like Erindi. No millions of other vehicles and you can sit and watch the whole thing from start to finish. Indeed it is a very good reason to go back there. The next lion sighting was even more thrilling. We had just visited a waterhole and were heading South when Paul noticed that a giraffe was hotfooting it out of the area. We drove no further than a few more feet when there they were heading for the waterhole. Backtracking we headed for a prime seat and waited. And I was able to get some more of those “shots” of lions at the waterhole. This group turned out to be the stars of Into the Pride. Cleo, the chieftaness who did not like Dave Salmoni, and had started stalking him, plus Winnie who had had cubs. We were well positioned for the shoot and once again, we were not really disturbed by another vehicle. We were with the group from 8.30 until almost 11am. That afternoon we decided to return to the same waterhole as our ranger was convinced they would still be there and lo and behold there they were. Softer light, some great roaring and play made it all worthwhile. Then we had two white rhinos join them at the waterhole and we were treated to a chase by the cubs who decided that taking on two rhinos would be thing to do! Another highlight was following a leopard sub adult who is the subject of more research and although collared and not really good for photography we were part of the habituation programme which in itself was a new experience. When we had arrived at the reserve our ranger had asked the standard question of what we would like to see. He was a little surprised when the Big Five didn’t come up and of course, the standing joke for us is to ask for a cheetah chasing a pangolin. We added an aardvark to the list and then one of my favourite animals the little DikDik. Towards the end of our stay we were rewarded with the DikDik sighting. Stunning opportunity and really close up. The only aspect of this sighting that slightly spoiled the affair for us was a Spanish family who had brought along their teenage daughters who made a huge racket on the back of the vehicle. Private vehicle, private vehicle kept on playing off in my head as I tried to zone out of the noise. I also need to mention the Kudu horns. The kudu males in this reserve have horns! Gorgeously developed with at least 3 turns – trophy specimens! And of course the aardvark. He came to the waterhole outside our room every night at about 10pm he would come shuffling in – but the orange tinted spotlight at the hole made photography impossible. But, a sighting nonetheless. Another one that got away was the black rhino. Erindi is home to a lot of rhinos both black and white and the rangers emphasize the fact that they will not let anyone know how many they have because of the poaching currently going on. I truly hope that this is enough to keep them safe. 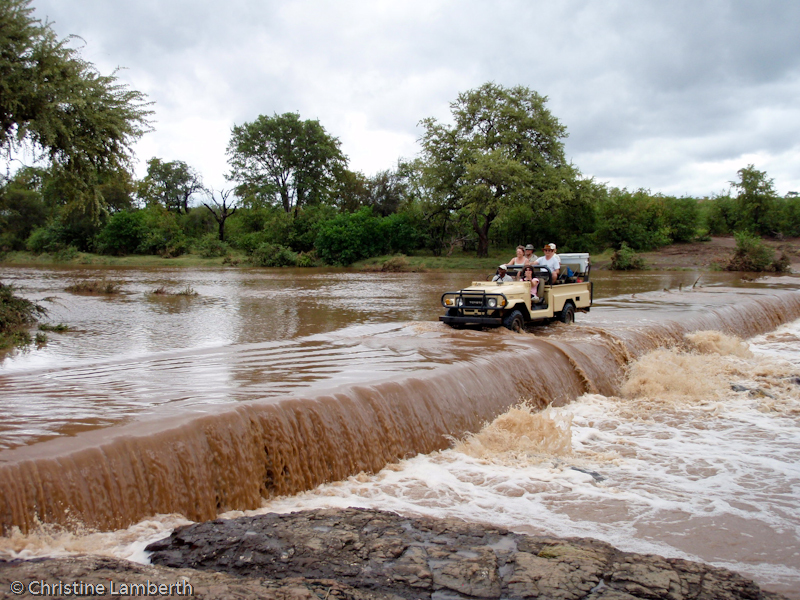 On the fourth night of our stay our ranger made a suggestion that we should go and camp out at the waterhole where the lions were resting and we simply park there and wait to see what happened. We positioned ourselves on the dam wall – set up the drinks and snacks and settled in for the wait. We didn’t see much action other than a pod of wallowing hippos and a foolhardy giraffe who wandered off in front of the lions but while we were sitting simply soaking in the ambience and atmosphere of the African bush we were treated to the call of a Pearl Spotted Owl and the memory of this remains as one of the most rivetting in our African Odyssey. There are no words to describe the sheer magic of the moment. This feeling stays with you forever and it is what you search for each time you return to the African savannahs. It is what the poets describe as the Soul of Africa and we are indeed privileged to be able to experience it. The lack of elephants in this reserve was noticeable. However, we had visited just too early. The rangers were all abuzz with excitement because they were about to be a part of a huge project the following month. 100 Etosha elephants were being moved to Erindi. The excitement amongst them was palpable and you could not remain disassociated from their banter about who was in line to be a part of the project. There was a downside to this trip and I think it deserves mention here because I believe the owners of this very special bit of Africa should take notice. The rangers are under instruction to return their guests to the Lodge by a certain time (dictated by the Kitchens) and if they fail to do so they are then “punished” by having to wash dishes in the kitchens. It is my considered opinion that someone needs to set the priorities right here. The guests come to see the animals and not the diningroom or the kitchen. In fact, even if the food was of a mediocre standard (which it was not) it really would not distract from the experience as it is not the prime reason to travel thousands of kilometres. The animal experience is what matters! And this reserve has the potential to tick off every box in that regard. A new adventure stretches ahead and with great anticipation the kilometers of tar are metered off. Finally, there between the koppies and the acacias lies the border post. Botswana is ahead! Park the car away from the grass and the rats that may decide to make a meal of the electrics and head for Passport Control. Then it is a patient wait for everyone to make their appearance while I desperately scurry around for a cool spot under a tree. One by one the group arrives and we transfer down to the river crossing. Pontdrift is an experience all on its own. During the rainy season it is always a gamble as to how one would cross but this time it is in the cable car. A painstaking experience with luggage and one or two people crossing at a time and then finally the rest of the bunch. Back into passport control and onto the vehicle which while standing still is a searing experience that the ice cold bottles of water do little to assuage. Finally the vehicle starts out and the rush of air is a welcome respite. Short lived however, because there is another stop at the airstrip to pick up more mad photographers. Then, off to the Lodge we go. About an hour later the camp looms ahead and we can unpack only to scurry desperately to get gear ready and off to tea. Then, onto the vehicles and finally, finally to relax for a short period before the fun begins. It begs a mention at this juncture that at Mashatu, where we are with the C4 Images Safari Photo Workshop Group that the vehicles at Mashatu are the ever present Toyota Landcruisers. This mere little fact intimates that you will have a bumpy ride and therefore be prepared to hold onto cameras and all other things while you bump merrily around the reserve. And for some of us this includes sports bras to do some of the holding. However, this cannot dampen any enthusiasm and expectations remain high. And Mashatu, as usual, delivers. In a riverbed we come across a lone lioness having forty winks under an overhanging tree. She is so relaxed and some great photo opportunities present themselves. Then darkness starts creeping in and we head off for the vaunted Southern African sundowners. (I haven’t had this experience repeated in East Africa - and its all got to do with a G&T with a nibble or two of good old biltong or some other African snack - definitely adds to the congenial atmosphere. Just as we had downed our drinks a cracking growl from nearby bushes sends us scurrying onto the vehicle while the dregs of the feast are unceremoniously thrown onto the vehicle and as we scour the bushes we are rewarded. A leopard comes sauntering along. The subsequent crashing of shutters is inevitable but the light is not good. Time and light has run out and the spotlight and flashes are next. However, the leopard kindly sticks around for a pose or two before sauntering towards the riverbed and inevitably…………the lioness. Great excitement grips the vehicle and we are off to see the fun. The lioness quietly waits for the leopard to appear and a spitting, growling encounter follows. Dust, paws and teeth are bared but the spat does not last long enough for the cameras and before we know it the leopard is high in a tree with a bloody nose while the lioness angrily stalks around the base. Then, disappointingly it is time to go. There is a threat of rain and unusually for the Northern Tuli block clouds are gathering in the sky. The next morning we leave early as usual and on our drive South we spot a few animals, a lonely hyena on his way somewhere, an ostrich pecking at the ground and not too much else. So, our trusty photo expert, the vaunted Albie Venter, suggests to the Ranger that we should head into the forest to look for a Pearl Spotted Owl. Instead of the Pearly we come across a pair of Giant Eagle Owls sitting side by side on a branch. Lighting is once again a concern but we manage to capture them as they are not interested in moving off at all. A small emerald spotted dove sits nearby and presents a pose before we move off again. We also are treated to a good cheetah sighting with a mum and two cubs playing hide and seek in amongst the grass and bushes. But, patience in this game is always rewarded and some good photos emerge. However, none that will make the POTY awards! The afternoon starts with a good opportunity to photograph a Corey Bustard who one day we hope will fly off so that we can get the photo of the year! And then, suddenly, a lion kill! However, as is usual with lions, it is already over by the time we get there. 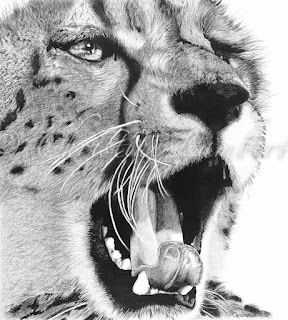 The pride has already done its arguing and it is a peaceful scene with lions lazing under the bushes in the afternoon heat stomachs distended and jaws open and panting. Last on the kill is an old dishevelled lioness valiantly tearing at the remains. After a good spell of involuntary shutter strike (a disease we wildlife photographers all suffer from) we head off for the river bed again. This time the elephants are on display. Intent on excavating for water we are able to move in fairly close and all the while the adults and sub adults demonstrate their prowess at shifting sand there is a little chap on the edge of the river occupying himself with a tuft of grass. These antics are endearing and heart stopping. This is what makes conservation so worth while. Those cumulus clouds are not moving on! During the night it rains! 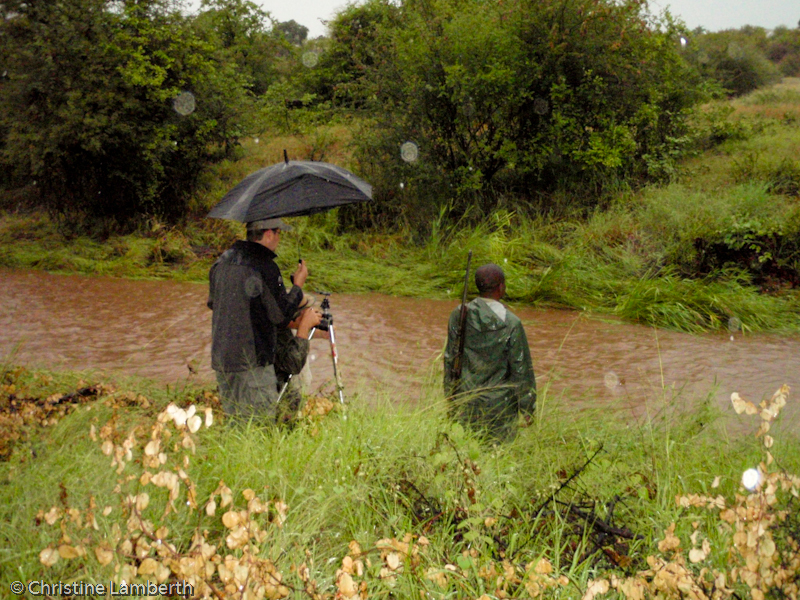 We are limited to where we can now go on the reserve because the rain was pretty heavy during the night. However, we are not disappointed and we get to a lion sighting of note. A whole pride with dad, mums and kiddies all spread out in a clearing. The lions move around our vehicle and we are able to get photographs from all sides. Dad’s bad tempered growls at some pesky youngsters and some good activity shots. Then, its time to head off for that early morning coffee (amarula for me thanks). And then, it rains! Not a little shower I might add but a downpour of note. Out come the ponchos and the camera equipment gets buried beneath swathes of weatherproofing. However, sustenance is not forthcoming as it would simply get watered down before it can be downed. Then the discovery that the poncho’s are not really waterproof after all and wearing them is entirely a futile exercise. On removing these dripping rags it is also evident that thin white cotton safari shirts become thin white see through shirts when wet!! We are privy to another great elephant sighting at the river where the elephants make full use of the abundant water. A couple of good abstract shots make the trip more than just a little worthwhile. 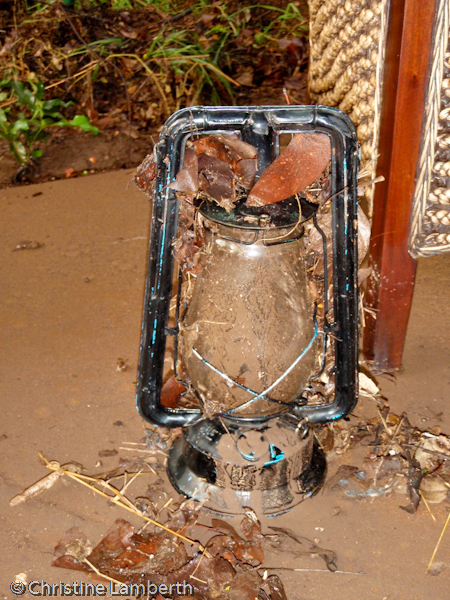 At about 9pm that night just as we are finishing our usual boma dinner the heavens open again. We head for our tent glass of wine in hand (can’t waste the excellent Bacchus nectar) and while in the tent I patiently wait for the abatement so that I can head for the loo at the back of the tent. However, I eventually make the executive decision that I will have to make use of an umbrella and step off the bed only to find a spongy like surface beneath my feet. A quick look out the front of the tent reveals a sea of swirling water around and under the tent. Then the panic sets in and in a great flurry cameras are packed into the storm case, toiletries make it into the vanity case in record time and passports are secured. After packing my clothes all the while Paul is still packing the cameras I count the bags. Seven! Certainly we can’t carry them all at once. So I pick up the passports, the vanity bag and the crumpler and head for the front of the tent. I get shouted at by Paul who thinks I’m deserting him but I’m heading for higher ground. Then the power trips and the headlamps have to come out. 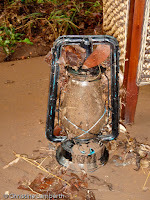 I then head out into the darkness looking for higher ground - which is the breakfast lapha. Albie and Isak meet me outside asking if they can help. I send them to get the cameras and my last bag. After depositing my load I head back to the tent. All that is left is for Paul to finish packing his clothes and my last words to him are to be careful when stepping out of the tent because it is built up on a cement base. However, needless to say I don’t think he is listening because when he makes his appearance both he and his bag are soaking wet! Soaking wet myself I decide a quick change of clothes is needed and a corner of the lapha with a towel and a handy husband do the trick and I manage to dry myself off. Then we wait. It is still raining and the river is swelling. Three tents have to be evacuated. In amongst all of this we notice that there is one couple missing. The camp manager runs to their tent and finds them peacefully sleeping through it all. We sit around till after midnight, we reopen the bar and some more of the good old Bacchus nectar calms the nerves. Finally at about 3am we head for higher ground and freshly made up beds. The valiant hardworking camp staff were all plucked from their slumber and unceremoniously herded back to camp to see to our needs. The next morning reveals the devastation. And it would appear that we are perhaps pinned down. Paul is hopeful. A few free nights are not unwelcome. The Limpopo is apparently so full that when the cable car goes over it disappears into the water. However, hope is short lived and by 12am we can head off towards the border and back to what is euphemistically termed civilization. The first river crossing is not a problem and we squelch our way towards the second. The veld is drenched and the roads are muddy tracks. At the river we forge across the concrete causeway wheels cutting through the surging water. A quick stop for some pics and onto the end of the weekend. 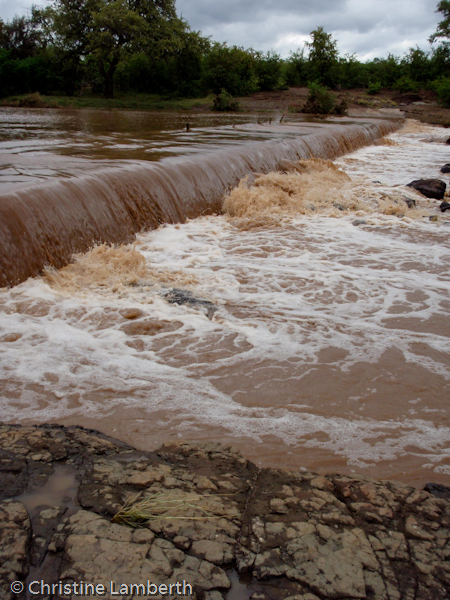 The Limpopo is a sight to see! Water water everywhere………… bank to bank! But the trusty cable car holds out and soon we are on the other side with our adventure locked into memory to be retold around many a campfire. The year started with a cancelled holiday to Australia and New Zealand resulting in a desperate trawling of the web looking for a break. We had to get away for a break! We turned to one of our favourite destinations that we hadn’t been able to visit for at least ten years. Zimbabwe. Naturally, with wildlife being the real destination, the criteria for the destination takes on a whole new meaning. No fences are high on the agenda, while large tracts of land and some water do not hurt the scenario at all. 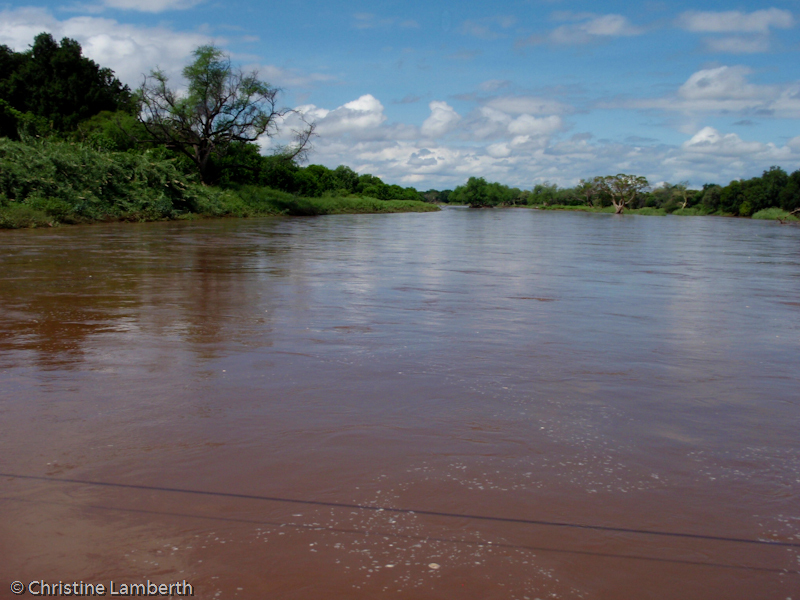 The indicators all pointed to the Zambezi. Further indicators such as very favourable rates for accommodation sent us hurtling through the skies to end up at Matetsi River Lodge. &Beyond lodges are well known for their excellence and the rates we got for a 6 day stay were amazing (being in January and last minute booking did help here). On arrival we were collected at the drop off point amid a thunderstorm that managed to turn the vehicle’s roof into a catchment area and the resulting shower we got was more than expected. However, we were pleasantly surprised at how the infrastructure of the area around Vic Falls had held up through what must be a harrowing ten years. Luxury accommodation at its best, the friendliness of the Zimbabweans has not waned through the tough times and the personal service must be a legendary accolade. Six days including flights in a five star Lodge came to a paltry R15 000. The bigger surprise for us was our ranger Calvert. Calvert has missed his calling. He should be in a formal education institution teaching Biology and Zoology. The lecture he gave on the humble vacuum cleaner of the veld, the dung beetle, would rival if not surpass any lecture given at an institution for Higher Education. 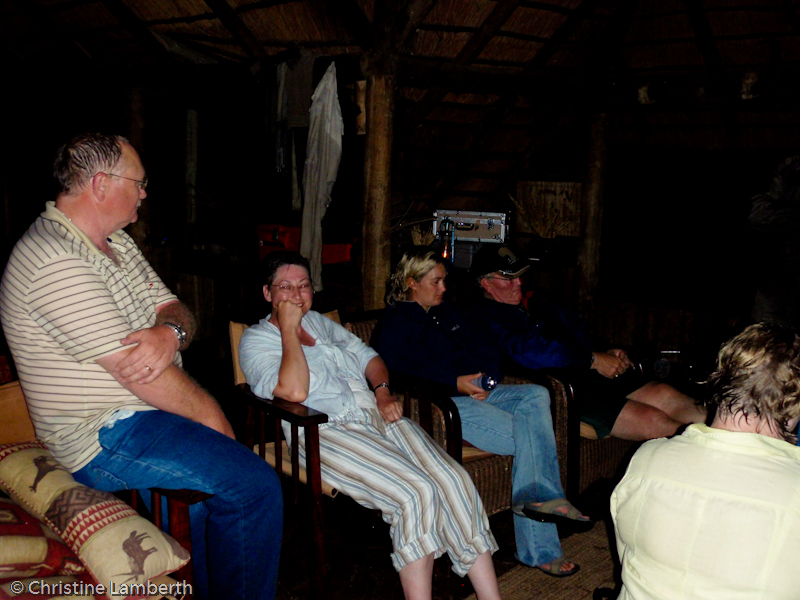 During our six day stay my knowledge of the bush increased tenfold, if not more. Another great advantage to this visit (because of all the bangbroeke out there) the Lodge was pretty empty and we were on our own on the vehicle most days. Added to this was the fact that there was no competition at sightings for vehicles jostling to get a view. Utter bliss for the passionate wildlife photographer. The dense bush (so much so for the stories about the elephants ruining Zimbawe’s eco system) was a challenge in itself and of course the fact that we could not offroad with our vehicle impeded our ability to look for predators. However, the lack of predator sightings meant that we concentrated on a lot of other aspects of the bush that one tends to shift to one side when off hunting the hunter. On test during this trip was a Canon 300 f2.8 L lens and 1.4 and 2 x converters. The rainy skies and resultant cloud cover was challenging for the converters and the exercise converted me to the belief that I don’t believe in converters!! Once we had assured Calvert that we weren’t here to hunt down the Big Five but were interested in all flora and fauna we were able to relax into bush mode but high on the list was hyena and sable and roan. Our length of stay also enabled us to get to see almost the whole reserve – 55 000 hectares. There were several highlights in this trip worthy of penmanship. The first was brought on by the fact that the Land Cruiser we were driving in was truly in dire straits. It putt-putted around the Reserve and then in a clearing in Kudu Alley it sputtered to a halt. The ironical events surrounding the rescue is an amusing bush story. Our tracker Stephen whipped out his cell phone and called the Lodge via Zambia!! While waiting in this amazing clearing we were visited by a troop of around 60 baboons who were intent on a natural salt lick to our left. They sat around completely relaxed and the photographic opportunities abounded. Babies, groups, the alpha male being preened, youngsters rolling in the sand etc. For more than an hour we sat stranded, however, for me the stranding was a completely successful exercise. I had no one wanting to move on and being impatient and I could thoroughly investigate baboon behaviour visually. My memory card started filling up and lenses got changed at alarming rates. 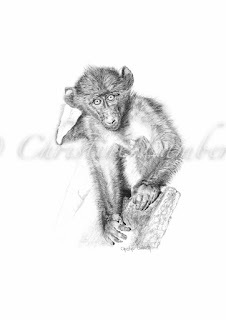 Result .........some great interactive shots of the Chacma Baboon. As for predators, we saw footprints of leopards, lions, hyenas etc. We were even lectured on the trackers interpretations of footprints and what can be read of the condition of the imprint which has, during this year, proved to be invaluable knowledge in other reserves. On our second last day we went in search of the daggaboys. The southern part of the reserve has a vast empty plain flanking what used to be the Chobe Channel. Then it was simply a small trickle of water flowing down towards the Zambezi (although with all the rain this past year it may now be a raging river!!). In the far distance we could see a small herd of Buffalo in an impossible place. However, the road was pretty close and after much bouncing and clutching onto seats, bars and cameras we pulled up next to them. They were in long grass and as we edged ever closer the raised noses led Calvert to switch off the engine. A soft rain started falling and we had to put on all the rain gear rather smartly. Then, the most surreal scene played itself off. Calvert, our Zoology lecturer, revealed another of his many hidden talents. He broke out into song. His deep bass voice rang out over the African plains with a Ladysmith Black Mambazo song and still today the goose bumps appear each time I think about it. All the while my shutter was clicking he was serenading the Buffalo. The wet horns, long grass, soft light and resonating lullaby tones resulted in a magical mix. As a last hurrah the hippos in the Zambezi decided to give us a show at breakfast time. Just as we were getting up to get ready to go the resident pod decided it was time to play. My camera gillie, Paul, became a handy tripod and over his shoulder I managed to get some of the best interactive hippo shots – it was one of those bush moments! The gaping mouths, splashing water and soft grey tones gave me enough time to snap up the spectacle. And as Paul tends to say..................just another sh*"%t day in Africa! !